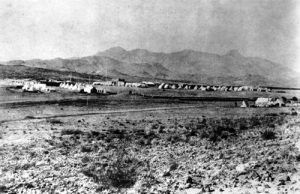 First “discovered” in 1846 by a Mormon Battalion traveling from Santa Fe to California, Cooke’s Spring, in present-day Luna County, New Mexico, was named after the battalion’s commander and would later become the site of Fort Cummings. After the spring was discovered, it and the nearby pass made it a popular overland route for travelers, but as such, also made it a popular ambush site for the hostile Apache. The first fort was established by Captain Valentine Dresher, who halted his Company B, 1st Infantry, California Volunteers here on October 2, 1863 during the Civil War. Choosing the site for a permanent fort, building soon began and over the next decade, a barracks, officers’ quarters, a hospital, and numerous other buildings were built, including a high adobe wall surrounding it. Later, Fort Cummings became a regular Army garrison, protecting travelers on the overland route as well as a Butterfield Overland Mail station that was situated on the site between 1858 until 1861. In September, 1867, the fort was called home to the 38th U.S. Infantry of Buffalo Soldiers, which included the only female known to have ever been a part of the all black regiments – Cathay Williams. During this time, the fort was suffered a brief brief mutiny in December, 1867 when a camp follower was expelled for stealing money. Several expeditions and many patrols set out from the fort, some as far as Mexico, but the soldiers made few contacts with the Indians. The fort was abandoned in 1873 and it the began to deteriorate under the elements. 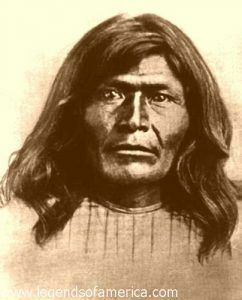 However, it was reoccupied in 1880, after a band of Warm Springs Apache under Victorio, bolted from the San Carlos reservation and began terrorizing southern New Mexico and western Texas. In 1886, one of the first test heliograph messages was relayed from Fort Cummings to Tubac, Arizona, and back over a distance of nearly 300 miles. A heliograph used a mirror to reflect sunlight to a distant observer by moving the mirror and sending Morse code. It became a simple but highly effective instrument in the 19th century and continued to be used up until about 1935. Today, there is little left of Fort Cummings, but the crumbling remains of adobe walls and earthen mounds indicating where foundations once stood. 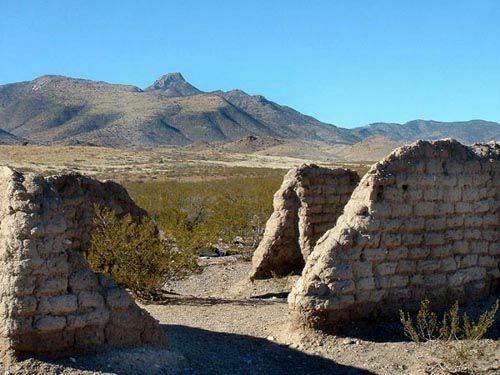 The ruins, currently “maintained” by the Bureau of Land Management, are located about 20 miles northeast of present-day Deming, New Mexico. To get there, take State Highway 26 about seven miles from Florida, New Mexico, then turn onto Cooke’s Canyon Road NE at mile marker 14, by the railroad water tank. After traveling a little more than a mile on a gravel road, the path crosses a cattle guard and jogs left onto a distinct Jeep trail. After several more miles, the road crosses another cattle guard and soon a plaque can be seen on the left, and an old cemetery on the right. The ruins of fort Cummings are about 500 yards to the north.